The traditional US wedding anniversary gift is paper. Quite frankly, paper is not that impressive of a gift if you just think of a piece of plain paper. But in fact, there are quite a lot of interesting and romantic gifts you can come up with if you add some creativity. Alternatively, Chicago Public Library had taken the initiative to come up with a list of more modern gift list for the wedding anniversary. For the first year anniversary, they suggested a clock, perhaps signifying the precious moments of marriage. It’s not clear to me, out of any organization, Chicago Public Library would be the one to make suggestions, but it seems to be quite accepted anyhow. Now with both paper and clock as choices, here are some of my suggestions to woo your sweetie when celebrating your first year wedding anniversary. 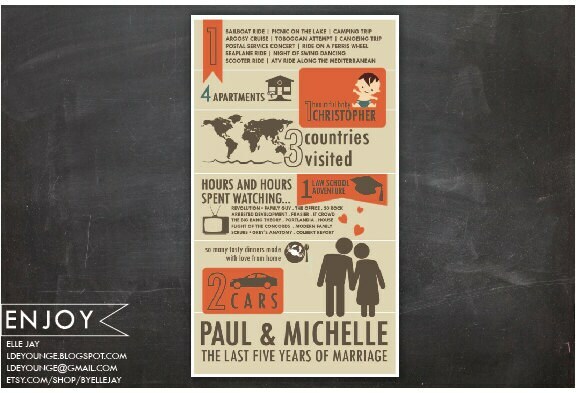 Get a designer to create a unique and personal infographic to commemorate your marriage of one year. You can include statistics like number of hours you know each other, number of nights you’ve spent as a marriage couple, number of countries you’ve visited together and number of pets you have, etc. Transfer your favorite photo of the two of you into pop art mounted canvas, perhaps one from your wedding. The portrait is original, fun and modern addition to your love nest. Instead of digging up a photo of the past, why not record the presence by a skilled photographer? You can then print your favorite one as large as you wish, creating a sweet memory so you can always get back to it in the future. This humorous coupon book will give your lover discounts and freebies that will keep you occupied until the next anniversary and beyond! 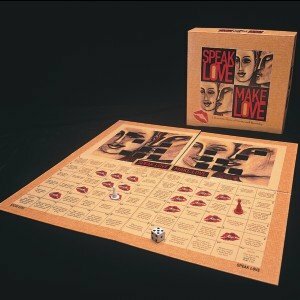 This easy-to-play game is a cooperative adventure meant to strengthen those little touches that keep romance in your life, starting right from your first year anniversary! The Kiss is a discreet expression of Gustav Klimt’s emphasis on fulfillment and the redeeming, transformative power of love and art–a perfect gift to celebrate the power of your love and a perfect way to spend quality time together. Every day will be marked by the special engraving message that you add to this magnificent gift. It’s a jewelry box; it’s a clock. She’ll be able to keep all her most cherished treasures in one safe place, including an engraved message from you. This gorgeous stainless steel watch with a mother of pearl dial and 16 diamond accents has a classic look that will be a show-off on her wrist-and a showpiece just for her eyes when she looks at what you’ve engraved on the back of the watch face. 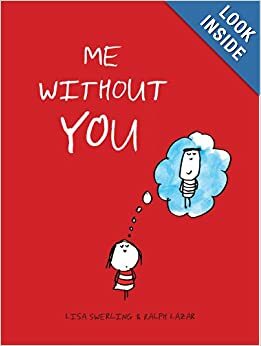 Me Without You features countless cute color illustrations of scenarios that are simply incomplete without you. Extraordinarily cute and romantic. And don’t forget to get flowers and chocolate! Comments? What do you think about these first year anniversary gifts? Tell us your experience? Do share!